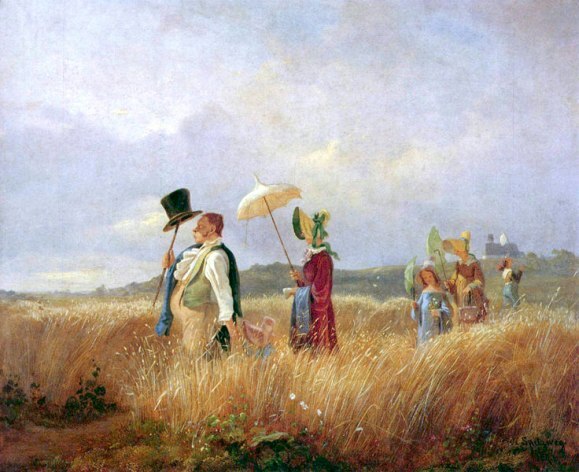 What at first glance appears to be a simple painting of a family out for a Sunday walk, perhaps going to or from church, quickly becomes recognizable as another charming and humorous work by the German artist Carl Spitzweg (1808-1885). What makes this landscape painting so fun is the simple act by the father of perching his top hat upon his walking stick and using them like an umbrella to shield himself from the sun. A barely visible child, holds onto his other hand, walking behind her father nearly consumed by the tall grasses. Morning glories bloom in riotous profusion in the foreground yet serve to somehow point the eye back to the central figures. Spitzweg completed this painting in 1841. To see more of his famous paintings, please visit our Carl Spitzweg biography.